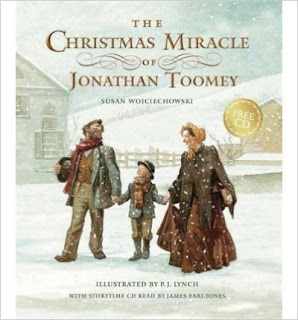 It is highly likely that I am one of the last people to have read the story of The Christmas Miracle of Jonathan Toomey , by Susan Wojciechowski. This year the story celebrates its 20th anniversary with a new edition being released from Candlewick Press. Alas, I had not yet made acquaintance with this tale until recently, but am looking forward to enjoying it with my own children as many times possible over the next several years. On the off chance that I'm not the last person in existence to have read The Christmas Miracle of Jonathan Toomey , it tells the story of a widower of the same name. Toomey is the best woodcarver in the valley and also a known hermit. After his wife and son's death, he secluded himself from society, not wanting to participate in anything with anyone. One day a widow comes to call on Mr. Toomey with a request that he help make a nativity set for her young son for Christmas. He rather begrudgingly undertakes the work and over the weeks leading up to Christmas he sees more of the widow and her son than he has of anyone else in quite some time. You can likely guess where that relationship is headed. (The cover art provides a very distinct clue!) This story is sadly sweet and terribly predictable, but that's exactly how I like my Christmas stories and so I enjoyed this one very much. If you think this sounds like a story you would like to add to your home collection, I would more than happily recommend it to you. I am excited to say that Candlewick Press has offered to give away one copy of The Christmas Miracle of Jonathan Toomey to one of my readers here at Reading to Know. I like to keep things nice and simple around here when it comes to giveaways. Simply leave a comment in the comment section below and include a valid e-mail address so that I can contact you if your name is selected. This contest is open to U.S. residents only and will be open through Wednesday, November 11th. THIS CONTEST IS NOW CLOSED. THE WINNER, as selected by Random.org, is #7 - Abbie. CONGRATS! Many thanks to Candlewick Press who sent a copy of the above title my direction in order to facilitate this review and giveaway. I received no additional compensation and all opinions are my very own. I hadn't heard of it either. Is it a picture book? :) Lovely! Oh, I love this story! This one I wouldn't give away if I won it! You aren't the last person to read this book. I haven't read it yet either. Thank you for your generousity Carrie! The front cover looks delightful! I want to read this book just because of the beautiful cover! So pretty!